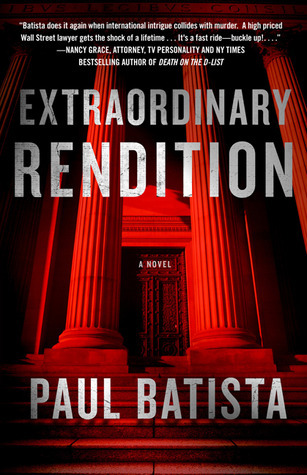 Today I have a guest post from Paul Batista, author of Extraordinary Rendition, about why he made the transition from busy lawyer to novelist. More basically, why exit from a business with a good regular paycheck to a business where the financial rewards are uncertain? Why exchange a suit for a casual shirt and jeans? I get asked these questions a lot, and they are in fact questions I ask myself. Let’s start with a disclaimer. I haven’t entirely abandoned the practice of law. This is work I’ve done for more than thirty years, and old habits die hard. Besides, I like it. More important is the fact that the legal work I do provides fuel for the novels I write. A criminal case or even a civil lawsuit involves a story, a narrative. Part of the function of a lawyer is to shape the narrative — not to fabricate facts but to tell a story. Creating fiction, however, does give me a license to do more than just shape the narrative of a case. In writing a novel I have the ability and the incentive to weave imagined events together, to create personalities and personal histories, to generate intrigue and conflict. In practicing law, I’m confined by facts — and those facts can be extremely interesting given the nature of the work I do — but there are no such constraints in writing fiction. There’s another factor. Law is a highly regulated business. No matter how independent you may be as a lawyer, there are people known as judges. They require you to do specific things on their schedule, not on yours. They want you to do things their way, not necessarily yours. They tend to have outsized personalities — wearing a robe can transform a guy or gal who in civilian clothes is demure and shy into a muscled-up action figure. And there are also clients. They get to call you in the middle of the night. The external controls on fiction-writing are different. Sure, an editor can set “deadlines” but those are more goals and aspirations rather than drop-dead dates. You can be disbarred for missing a judge-imposed deadline if you do that too often. The worst a publisher can do is get mad at you. But the most important reason for transforming myself into a novelist from a practicing lawyer is the beauty of transformation. The stuff of a novelist’s life is different from the stuff of a lawyer’s life. Creating novels is a liberating experience; you can let loose your imagination. I find I can have a passion and a drive that, even though I’ve loved practicing law, I can’t completely tap into in a courtroom. You hear commencement speakers constantly delivering to young graduates the trite mandate to “follow your passions.” As you move through life and hit the jarring realities of jobs, families and obligations, you can get cynical about those conventional admonitions to follow your passions, live out your dreams, and fulfill your talents. But those inspirational messages do have meaning, at least for yours truly. Even a lawyer can break out of the constraints of the life he or she has lived. There is something invigorating, even for a seasoned adult, in taking risks and having the courage to give up security and embrace something unknown, strange, exciting — fresh. Paul Batista, novelist and television personality, is one of the most widely known trial lawyers in the country. As a trial attorney, he specializes in federal criminal litigation. As a media figure, he is known for his regular appearances as guest legal commentator on a variety of television shows including, Court TV, CNN, HLN and WNBC. He’s also appeared in the HBO movie, You Don’t Know Jack, starring Al Pacino. Batista’s debut novel, Death’s Witness, was awarded a Silver Medal by the Independent Book Publishers Association (IBPA). And his new novel, Extraordinary Rendition, is now being published—along with a special reissue of Death’s Witness—by Astor + Blue Editions. When Ali Hussein, suspected terrorist and alleged banker for Al Qaeda, is finally transported from Guantanamo Bay to the US mainland to stand trial, many are stunned when Byron Carlos Johnson, a pre-eminent lawyer and son of a high-profile diplomat, volunteers to represent him. On principle, Johnson thought he was merely defending a man unjustly captured through rendition and water-boarded illegally. But Johnson soon learns that there is much more at stake than one man’s civil rights. Hussein’s intimate knowledge of key financial transactions could lead to the capture of—or the unabated funding of—the world’s most dangerous terror cells. This makes Hussein the target of corrupt US intelligence forces on one side, and ruthless international terrorists on the other, and puts Byron Carlos Johnson squarely in the crosshairs of both.